Round 12 : Ch 3 (counts as first dc), dc in each st around. Join with a slipstitch around ch 3 as if to front post. Wind the yarn around the paperback book (the 4.25” way) 30-40 times. Cut the yarn, thread yarn through a yarn needle and pass the needle under all the loops. Tie the end of the yarn firmly around the loops. Slide the yarn off the book and cut the loops opposite the tie. Wind the end of yarn around all the loops below the fold and fasten securely. Pass the needle through the top and use the end to sew the tassel in place at the top corner of the hat. Trim the ends neatly. Very nice - I also hate seaming!! so pointless when you can do without them!! I have a hat crazy GD need I say more :) thanks once again for sharing. Hello! I love this hat, and am wanting to make one for my goddaughter. I'm very new beginner, so bare with me. But I am confused! Haha. I did the larger size, and chained 28, but where do I join it to make a ring/round? And it was way to small even when I did the chain 28 if I did join it, so I think I'm missing something. My email is nikki.m.martin@tmail.com. Thanks!!! The begining cahin isn't joined into a ring. Notice it doesn't say anything about joining into a ring. You crochet on one side of the chain and then around and on the other side. Just do it and you will see how it starts to take shape. does this mean hat is not really worked into rounds? its worked left to right? is it starting at top of hat or bottom? not sure what you mean by working on one side of chain and then on other. does this mean i'm working top of chain and bottom? not left to right? It is worked in rounds starting at the top. You work in the chain in the usual manner, then work around the end and up the other side of the chain. Hi Suzetta. 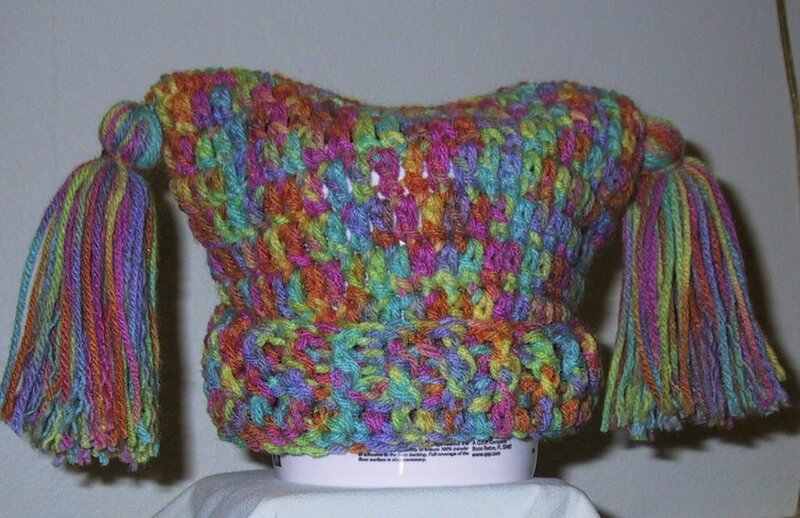 I would like to try to make one of these tassel hats for a newborn. Approximately how many should I chain so the hat is more suited for a newborn? I would use sports weight yarn and a G hook, then make the smalelr size. Good luck. I think you are very talented. I love to crochet. I have a very large family. some in the state and some out of the state. right now I am working on this pattern for my cousins daughter they live in Buffalo Ny.I think that she would be so cute in this hat. I have fallen in love with this patterns. This is the second patterns that i have made from your site. Thanks for posting you have done a great job...!!! I think you are very talented. I am making this pattern for my cousins daughter. I do not get to see them they live out of state. I hope she likes it. I have made a different pattern i am very impressed with how easy they are. Thank you again...!!! Clever, did you line it with fabric? Any tips on how to increase the size of the hat so that it fits an adult? I want to make one for myself :-) Is it a matter of increasing the number of rows or the beginning number of chains or both? I'd start with 30 chains. Probably will need more rounds as well. But you can tell by trying it on, since it is for yourself. This is a great pattern!!! However, I am confused how you get 50 sc in the first round when there were 23 to begin with? Love this! Worked up in a day! I also thought of a little matching purse.